Hecate Enthroned is often compared to Cradle Of Filth with its arty stylings and keyboard firmly in place. 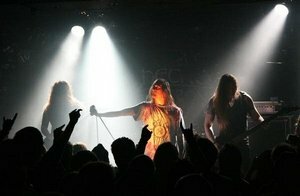 The band was formed out of the ashes of Daemonum in 1995. Jon would leave to join Cradle Of Filth, but would soon return. The act soon issued the An Ode For A Haunted Wood demo. The band's bassist, at this point, Paul later joined Reign Of Erebus. Upon Promeathean Shores (Unscriptured Waters) was the first release of the band by new label Blackend. It was actually a new version of band's demo. The band's earlier singer Jon was a bassist with CoF, although he was replaced by Dean in 1998. Dean joined just in time to sing for the band on tour with Enthroned and Usurper, replacing Jon who was not willing to tour. He officially joined the band in January, 1999. Daz replaced Michael in the autumn of 1998. The anti-Christian band toured as openers for Satyricon and Behemoth across Europe in order to promote Kings Of Chaos. The band issued an EP malignantly called Miasma in late 2001. The band entered the studio in January 2004 to record a new album called Radimus (We Return in Latin). The album was originally named Acts Of God. In a surprise announcement, the band lost singer Dean in February. He disagreed with the other members' yearning for 'progression' and left on good terms. The band also cited Dean's need to be with his family as a factor for his departure. Soon thereafter, the band recruited keyboardist Pete and new singer Dagon formerly of Heathen Deity. The band’s first tour in six years would take place August of 2006 in the UK. Awakening from slumber, the band confirmed an appearance at the Hard Rock Hell II festival, which was to take place December 5-7, 2008 at Prestatyn Sands in Wales. In 2013, Hecate Enthroned recruited vocalist Elliot Beaver (Aeternum) and drummer Gareth Hardy. The band signed a deal with Crank Music Group for the release of its next album. The follow-up to 2004's Redimus was entitled Virulent Rapture. Hecate Enthroned signed with M-Theory in 2018 and was to issue a new album in January. The band’s last album had appeared five years prior. Joe Stamps was on vocals since 2015. Hecate Enthroned release a new album called Embrace Of The Godless Aeon through M-Theory Audio in January. It is not due to vocalist Jon's former membership in Cradle Of Filth that the band is often compared to the more popular band. Rather, it is the band's musical compositions that invite such comparisons. The band blazes through high speed black metal which is interspersed with the usual keyboards. It is notable how the same instrument that is utilized in heavenly associations is often found in the same bands claiming antagonism to religion and to God. It is a sign of ignorance. Whatever the case, Hecate Enthroned is no more or less than a British black metal band whose sound is a more serious version of Cradle Of Filth. Special mention is accorded the band's intro whose chilly atmosphere takes me back fourteen years to Satan's debut LP. Deserving of attention is Metal Blade/Death Records and its signing policy. For one, much like its brethren Century media and Nuclear Blast the label has abandoned the habit of signing demo bands with A&R simply ignoring arriving demos. The named labels seemingly only sign or license bands with previous (selling) albums. Is true A&R dead? More specific to Metal Blade is the habit of latching unto a trend... a year or so late. Last to jump on the Swedish death metal trend the label's signing of Desultory was the least effective of such signings. Last to discover Decorayah, the prime of gothic keyboard rock was past when the label signed the Finns. Now having discovered the new generation of black metal bands the American pioneering label is unto Ancient and now Hecate Enthroned. Once again it is late. The world suffers from face paint saturation even if many black metal bands remain valid. Ali "The Metallian"
This albums marks the presence of a number of powerful elements, like a bestial vocalist, blazing guitarist, powerful drummer and ripping songs...plus an absolutely unessential keyboardist. It's akin to receiving a cold shower in mid sleep. It could have been so good. Possibly their best release to date, Hecate Enthroned's (yet again) revamped line up can deliver an astounding death/ black album filled with whirlwind metal rides and lots of thrills if they wanted to - just listen to the surges of power in Perjurer or the composition qualities of The Downfall - but instead elect to include the damned sounds of the heavenly instrument to relegate their entity into yet another deluded metal combo. Alas, for the potential. - Ali "The Metallian"
Redimus is an abysmal album. This English band sees merit in mixing crude Cradle Of Filth-type fast riffs with weak growling and the customary ton of keyboards all set to weak drumming and weaker production. The confused keyboard intrusions, the Morbid Angel riff on As Fire and the Type O Negative copy song Redimus might be the reason for departure of band members, but no amount of wife swapping will save Hecate Enthroned. Mark these words. - Ali "The Metallian"